Kefir is a cultured milk drink that originated in Russia and is made by fermenting milk from a cow, goat or sheep along with yeast and bacteria. Kefir can be compared to yogurt with a slightly tangy and creamy taste. Kefir can be made at home easily as long as you have high-quality kefir grains to start. 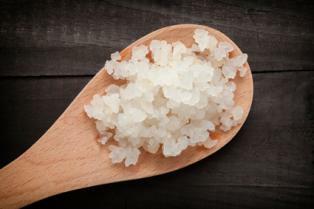 The first step to making kefir is to find quality kefir grains. If you know anyone else who makes kefir, ask if you can have some grains to get started. 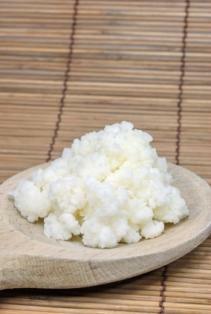 Since healthy kefir grains multiply, most people who make kefir regularly have extra. Real organic kefir grains can also be found online from any reputable dealer such as The Kefir Store. Follow the instructions below to make your own delicious and healthy kefir. Place about 2 tablespoons of kefir grains into a clean jar. Add two cups of fresh milk. Cover the jar with the piece of cloth and secure it with a rubber band. Set the jar on the counter at room temperature for 24 hours. If you have a cold kitchen, you might have to keep the jar in the warmest part of your kitchen as the grains like to be warm. Be sure to keep the jar out of direct sunlight. Check the grains after 24 hours and check the thickness. The kefir should be getting thick at this point and starting to separate into curds and whey. If it has not started to separate, leave it for another 12 or 24 hours. Stir the kefir, mixing it up until it is liquid and pour it into a strainer to separate the grains from the liquid. Pour kefir liquid into a clean glass jar. Place the remaining grains into another clean jar for your next batch of kefir. Homemade kefir will store in the refrigerator for several months. Flavored kefir can be made using a batch of homemade kefir. You are essentially fermenting your already made kefir a second time. Place the cinnamon stick and chia tea bag in a clean glass jar. Pour in 2 cups of homemade kefir and close it up with a tight-fitting lid. Leave the jar on the counter for 24 hours to ferment again. Remove the cinnamon stick and the chia tea bag. Replace the lid and store the kefir in the fridge for up to a year. 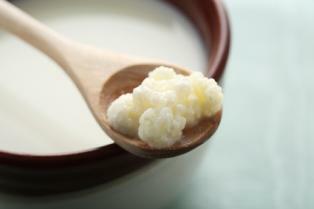 Kefir has been used since the beginning of recorded history and has documented health and curative properties. It is loaded with protein, calcium, niacin, folic acid, vitamin B-12 and good bacteria. The friendly bacteria ingest the milk sugars which make the kefir sour. This process makes the drink extremely healthy by creating an environment where good bacteria can thrive. When you drink this healthy bacteria-rich beverage you do wonders for your digestive tract and immune system. According to Chris Kesser, licensed acupuncturist and practitioner of integrative medicine, kefir is also a rich source of many different vitamins, minerals and essential amino acids that promote health and wellness. Enjoy kefir straight or use it as part of a delicious and healthy smoothie mixed with fresh fruit, ice and natural sweetener. Adding kefir to your healthy diet will ensure that you keep your healthy bacteria counts high and your immune system strong.